What is it? A turn-based stealth strategy game with a cyberpunk spin. The spy movie, as the critic Brian Phillips pointed out a few years back, is at its heart a fantasy about tourism. The spy skips all the fussy details of travel—the discomfit, the bewilderment, the checked baggage restrictions—and cuts right to the landmarks. They know all the roads intuitively; they’re always fluent in the language. And if the spy of popular media is a fantasy tourist, then the hacker is a virtual one: ducking through the back alleys of cyberspace and turning the enemy’s tools against them with engineering jiu-jitsu. They never miss a semicolon, or spend an hour refreshing Stack Overflow. For the elite hacker-spies of Invisible, Inc., the act is so ironed out that it’s almost frictionless. They beam straight into the inner sanctums of evil zaibatsus like they came directly from the USS Enterprise. Another button press, and they’re in the network wreaking havoc—assuming control of computer terminals, surveillance cameras, and security drones. It all feels too effortless, at first, as your agents trade off turns with the enemy guards, spending action points to sneak around and override their systems. And then a momentary lapse forces your hand and you kill a guard, which raises the alarm level, which activates a new camera, which catches one of your characters dead to rights, resulting in a miniature fox hunt that sends the alarm level even higher, calling in heavier armored guards right next to your first character, who just used their last bullet to kill that first guard, and you know what? Let’s just hit the rewind button before this gets really out of hand. It all starts when the Invisible crew is raided by a global trust of militarized megacorps. The team is scattered and shaken, but sets about clambering back into the fight with the help of an omniscient artificial intelligence named Incognita. Incognita can only function on backup power for 72 hours (or whatever time is pre-specified in the exhaustively customizable options menu), so the agents go on a global pillaging campaign, swiping as many corporate assets as they can, culminating in a grand coup d’mainframe to reinstate their AI. Enter, the spy-as-tourist. Prospective missions crop up on a world map a-la XCOM: Enemy Unknown, offering varied rewards in exchange for time against Incognita’s countdown. Do you shlep all the way to eastern Russia for a difficult rescue mission, knowing it will cost you twelve (scaled down) hours? Or do you plow through a string of Mediterranean headquarters nearby that promise lightly guarded cash, weapon caches, and powerful cybernetic implants? It sounds quaintly romantic—abstracted as it is—the cyber spies globetrotting in their personal jet, collecting gadgets. But the spies are also hackers, and hackers are fettered to the tools of their trade. Nobody hides their server farms at the Eiffel Tower or the Taj Mahal. Consequently, a given level in Invisible, Inc. looks about the same as any other: a warren of grid-based conference rooms floating in a void, whether in Dublin or Dubai. The utilitarian surroundings spoil some of the fantasy—imagine Neo never escaping The Matrix, doomed to crouch-run between cubicles in perpetuity. The modular design does serve an end, however. Invisible, Inc.’s levels are procedurally generated, shuffling up hallways, security, objectives, and extraction points so that no two playthroughs are alike. The resulting unpredictability buoys the game’s stealth, dissuading players from the rote memorization that’s always been anathema to the genre. Take the previous hypothetical, with its exponentially increasing comedy of disasters. It might have been avoided, had I saved a single action point on my turn so my character could “peek” through a door prior to throwing it open. Even spotted, there’s a saving chance to hop to an immediately adjacent tile if it breaks line of sight. Or I might dive another character towards a nearby terminal and siphon some power, which can be used to turn a turret that will kill the guard. The gambit might pay off, but it also might cause delays or unforeseen complications that cause me to miss out on a chance at the enemy’s vault, or even lose two agents instead of one. Or maybe I burn a precious “rewind” chance to reset the turn and try a new permutation? Risk and reward are gauged, then a door opens, a new variable walks in, and they have to be gauged anew. Many of these variables are ushered in by the alarm system, which begins ticking up from the first turn—even if the player remains undetected. After a few turns, or an unstealthy blunder, the alarm ratchets up, introducing new layers of security on enemy electronics and additional patrols, or even broadcasting the location of the player’s agents. The effect’s a bit like having a downward slope underfoot—you might be able to ignore it, but if you trip, you’re going to roll for a while. 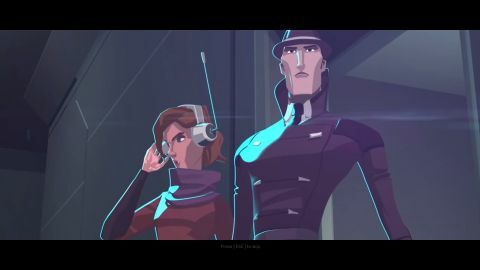 On anything but Beginner, Invisible, Inc. poses a steep challenge, and any given run through the campaign can come crashing to a halt if things suddenly get out of hand like that. When it happens, almost everything’s lost for good, in the spirit of a roguelike (save files even wipe upon completion of the campaign). But a few abilities remain, like the ones which govern Incognita’s hacking abilities, and accumulated cash is banked towards new agents, many of whom completely upend the manner of play. “Internationale,” for example, can remotely activate the terminals that power up Incognita’s hacking interface, even from behind walls. That’s the power problem solved, almost singlehandedly. I find it hard to go without her. They’re a captivating rogues’ gallery, with the elegantly tapered musculature and Easter Island heads that Klei favors, and wonderfully haughty, disinterested British accents. Of Decker, a noir Blade Runner in a trenchcoat, Central, the M of the group says, “The 20th century thing is an unfortunate affectation,” affecting dame Judy Dench’s Bond matriarch in the process. It’s a pity that they rarely speak, and outside of Central, Incognita, and a rogue merchant named—ugh—”Monst3r,” they have little bearing on the terse plot that strings the procedurally generated levels together. I’d have liked a chance to know them better, beyond the rap sheets we’re given. “Isn’t that why we travel in the first place … how we’re able to know each other at all?” Phillips poses, and, “to be a tourist is to be a spy with his cover blown.” The great success of Invisible, Inc. is that it uses that prospect like a lingering tension. A wall hides an inconvenient guard, a firewall hides a malicious script, and suddenly the plans have changed, and it’s no longer possible to be a dispassionate spy, memorizing patrol routes and waiting out alarms. The team is strung out, the guards are closing in, the plane is leaving. Who makes it? Newly unlocked characters completely upend the gameplay you’d just acclimated yourself to on a previous playthrough. Open a door from just to its side, and any guard that sees it will wander through for any easy ambush. KO’d guards need to be carried, or pinned by an agent on the same tile, or they’re quick to recover. As the security level rises, hanging around to clear a level gets increasingly risky. Split up and risk a single agent getting isolated, or stick together and risk being spotted easier?